When you've got an unsettling ant infestation on your hands, the search for a simple home remedy may lead you to baking soda. But is this kitchen staple really effective in helping you get rid of ants inside your home or in your garden? Keep reading to learn more about baking soda as a potent ant pesticide. Does Baking Soda Kill Ants? We all can agree that ants are among the most common household and garden pests. In order to understand how baking soda can fight off these insects, we should first take a deeper look into their invasive nature. In fact, there are about 12,000 known species of ants! The most commonly-recognized types are fire ants, crazy ants, carpenter ants, and ghost ants. These insects are known as the super workers of the animal kingdom. This comes as no surprise, considering the fact that an ant is capable of carrying up to 50 times its own body weight on its back! Read Also: What do ants like to eat? As social insects, the strength of ants is in their numbers, and an infestation can be very frustrating especially if it takes place inside your home. Ants are omnivorous—they'll devour crops just as gladly as they'll munch on other insects. Ants also have an unrivaled appetite for sweets such as honey, maple syrup, and sugar. These insects scavenge virtually anything they can consume—from leftovers to crumbs or droppings—to support their colony. Some ant species build their nests through mounds of soil (otherwise known as ant hills) which can be a garden problem. On the other hand, other species such as carpenter ants establish their colonies inside the home—potentially damaging its foundation. Although most ants are practically harmless, some species bite or sting—leaving trails of swollen spots or blisters on skin. These itchy, painful spots can, in the worst cases, trigger allergic reactions. Baking soda, at its core, is a base mineral. The scientists among us might know it better by its chemical name: sodium hydrogen carbonate. Laymen, though, will known baking soda by its white, powdery appearance and its salty taste. Essentially, this element is used in baking as a leavening agent to create air pockets and bubbles in the baked goods. Baking powder, which is often mistaken interchangeably for baking soda, is a mixture of the latter, an acid mineral, and a small amount of cornstarch. Baking soda is much more than just a main ingredient of our baked favorites such as muffins, banana bread, and brownies (among many others). As a natural cleaning agent, baking soda knocks out the toughest stains, grime, and bathroom mildews. It can be used to de-clog sinks and deodorize your home. As part of a beauty regimen, baking soda can be used to improve hair and skin texture, as well as whiten teeth. Read Also: Does cornmeal kill ants? 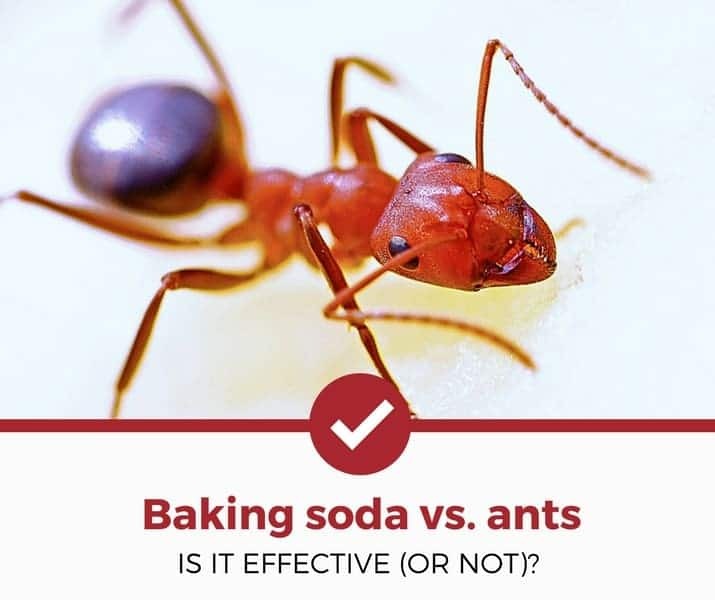 Can Baking Soda Kill Ants? We hate to burst your baking soda bubble. But...this element as an ant insecticide is, in fact, just a myth. There are rumors circulating around the internet that baking soda, when mixed with equal parts powdered sugar, will effectively kill ants. As natural scavengers, ants take this homemade poison back to their nest and infect the rest of the colony. When ingested, baking soda produces bubbles of carbon dioxide, which explode the infected ant from the inside out. Here's what we know: no scientific evidence has proven this theory. Unfortunately, we can't confirm or deny this notion, because there's no reputable source to back up these claims. What we recommend instead: know the facts. Research the best ways to properly deal with ants in your home, around your property, and in your garden. Always remember: if the pest control solution seems too good to be true...it probably is. Protect your home, your family, and yourself from these biting insects and invest in the proper tools to eradicate them for good.